While margarita’s can be enjoyed year round, warmer weather calls for margaritas on the patio. Whether your taste runs to the sweet and tart classic, fruity, smoky or spicy we offer recipes for them all! Combine all ingredients except garnishes in a cocktail shaker and fill with ice. Shake well, and double-strain into a chilled glass with a salted rim. Twist orange peel over the top of the drink to express orange oils, discard the peel. Combine all ingredients except the garnish in a blender with 1 cup of ice. Blend until smooth, and pour into a Collins glass. Garnish with watermelon slice and serve with a straw. Add all ingredients except salt to a cocktail shaker and fill with ice. Shake vigorously, and strain into a rocks glass half-rimmed with smoked salt. Crush the jalapeno in the bottom of a mixing glass using a muddler. Add remaining liquid ingredients, cucumber puree and ice to glass. Shake well, and strain into a double rocks glass rimmed with chili powder and salt. Fill glass with fresh ice and garnish with cucumber wheel. How to rim a glass with salt. Experiment with different types of salt like pink Himalayan or black salt for drama. Pour the salt on a plate or shallow dish. 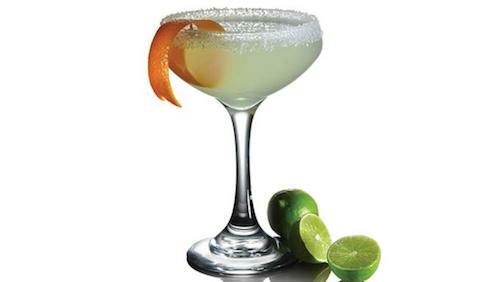 Cut a slit in the lime, and rub it along the rim of the glass to moisten. Roll the edge of the glass in the salt to coat. Set the salt rimmed glass in the freezer while you mix your drink.